The Portland men's tungsten carbide band perfectly balances style and comfort. The domed profile features a satin finish that compliments your hand and the comfort fit allow you to wear the ring with ease. The center groove is highly polished and reflective to draw attention. 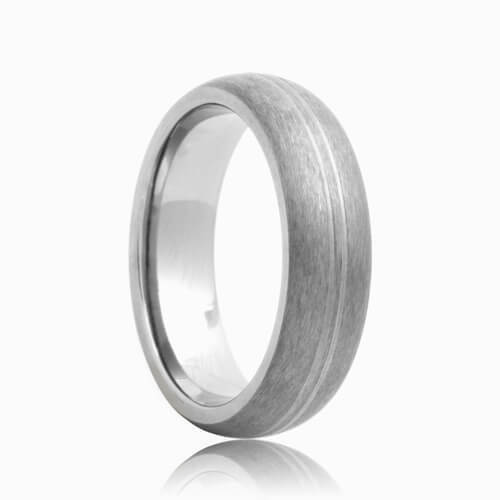 This tungsten band perfectly blends durability and style. All of our tungsten wedding bands are highly scratch resistant and are completely maintenance free. Most sizes ship within 2 - 3 business days. Free Lifetime Warranty and Lifetime Sizing; pay no restocking fees or deductibles! I don't think anyone will be able to write a better review than me. I did cheat a little by bringing my fiance along and I got him to choose the style himself. But that didn't diminish the level of excitement we had when we finally too the ring home. He wore the ring the next day and he has simply been beaming since then. To be fair, it really is a very elegant ring.. The process was very straight forward and as a result, he got the perfect tungsten wedding band. I can't imagine buying another tungsten wedding ring in any other way.